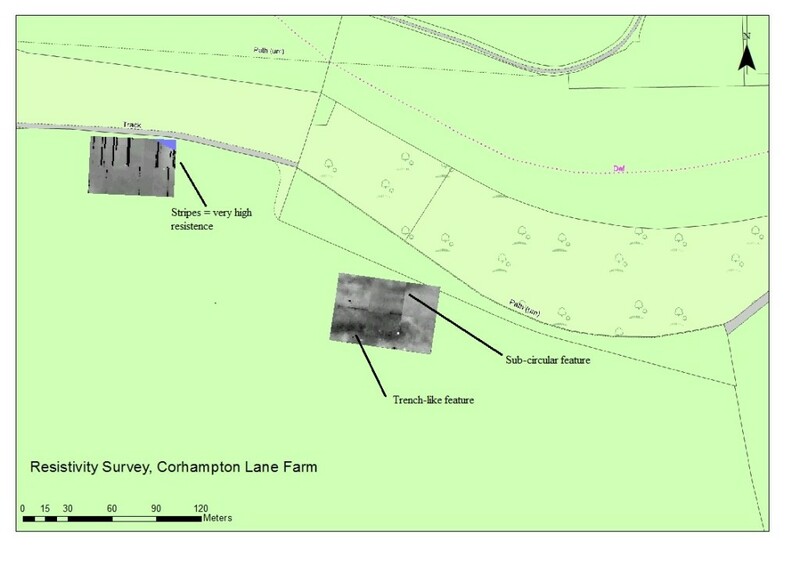 The Project’s first Pilot Survey took place at a location on Corhampton Lane Farm. It was a community project that had the joint aims of introducing and training local volunteers in non-intrusive archaeological techniques, i.e. non-excavation, while recovering evidence that would hopefully contribute to our knowledge of the area during the Anglo-Saxon period. A relatively large collection of metal artefacts, which had previously been recovered by our Project’s metal detectorists (Mike Gaines and John Whittaker), first attracted us to the area. Moreover, an aerial photograph revealed the presence of a pair of ring-ditches: the probable remains of Bronze Age funerary barrows. The assemblage of metal artefacts includes a number of Anglo-Saxon objects that are typical of finds recovered from early Anglo-Saxon graves. It is known that the early Anglo-Saxons made a practice of locating their cemeteries around earlier monuments – for an excellent local example see the archaeological work undertaken at Storey’s Meadow, West Meon [http://www.tvas.co.uk/resources.html]. The assumption was therefore that one of the ring ditches was the site of the Anglo-Saxon cemetery that had produced the artefacts; to investigate this notion a geophysical (resistivity) survey and metal-detector survey was planned. Mike and John were the experts charged with leading the metal detecting, while the geophysics was led by Maisie Marshall, an archaeology student from the University of Winchester. We commenced our work on the Friday, a very warm early Autumn day and were blessed with splendid views across the Meon Valley to Old Winchester Hill – an important prehistoric site. This day’s work centred on the eastern ring ditch, which overlooks the valley and was considered to be the most likely candidate for the location of the Anglo-Saxon cemetery. This idea was based on the fact that the burial ground would have been visible to people living in the valley below and conforms to the pattern observed elsewhere, most notably just along the Meon at Shavards Farm. After a brief introduction to the area and its Anglo-Saxon background the volunteers divided into two groups. One group set about gridding out an area over the probable location of the ring ditch in preparation for the resistivity survey. The importance of having accurate grids, which acted as the recording framework for the surveys, was explained to the volunteers. The second group were using metal detectors and instructions were given on interpreting the different signals that metal objects produce and how to locate objects effectively by adopting a systematic and rigorous approach. Resistivity survey. In total an area of 60x40m was divided into six 20m squares and surveyed (Area 2, see Fig. 1) using 1m intervals and transects. A RM15 resistivity meter was used. The meter transmits an electric current through the ground and the resistance is measured and recorded. Each volunteer gained experience in using the resistivity meter, in addition to moving the guidelines that marked out the transects. Very good progress was made and the whole area was surveyed within the day. A preliminary assessment of the data revealed the faint outline of a ring ditch but no other features, certainly nothing that could be interpreted as being indicative of an early Anglo-Saxon cemetery. Metal detecting. The volunteers soon appreciated that metal detecting is harder than it first appears. In particular, the weight of the machine combined with the demands of keeping the search coil level led to a few aching arms! As already mentioned, the area had previously been searched so the number of significant finds was quite low. The highlights include several coins (Roman, medieval and more modern), plus a handful of objects that could possibly have come from early Anglo-Saxon graves, such as a copper alloy ring and some copper alloy fragments. In contrast to Friday, Saturday was much more autumnal, but we welcomed some new volunteers and the focus shifted to the western ditch where another 60x40m area was targeted (Area 1, see Fig. 1). Once again, progress was good, although at one point technical difficulties with the resistivity meter, i.e. the logging of very high values as indicated by black stripes on Fig. 1, almost resulted in the survey being abandoned! But at the last minute it decided to play ball and the team pushed on to complete the area. Metal detecting also moved over to this area and a similar range of finds to the previous day was recovered. The geophysics results from the Saturday did not reveal any obvious archaeological features; in fact the area looks to be sterile. This is frustrating because we were confident that the grid was sited correctly over the ring ditch. The difficulties that the equipment suffered could have affected the recording of the data. Furthermore, when Maisie reprocessed the results from Friday in a different way, as advised by staff from the University, the ring ditch disappeared! There is, however, another part of a sub-circular feature, which although it is in the wrong place for the original ditch, is interesting. In addition, a strand of higher resistance can be seen extending through two of the southern grids, approximately 5m wide and quite straight. It could be a trench of unknown purpose or a feature of the natural geology. Overall, the two days surveying at Corhampton were very enjoyable for all who took part and although the results are not particularly archaeologically significant, the training provided to complete novices was successful. We would like to thank all the volunteers who participated in the survey, particularly for showing such interest and enthusiasm. The area still has potential as revealed by the features discovered in Area 2 and we have plans to reinvestigate it, probably using a different geophysical technique. The Pilot Surveys are an opportunity for the experts to refine their approaches, not only in how we implement and carry out surveys but also how we deliver training to volunteers. The experience of this first survey, although generally positive has identified several things that could have been done more effectively and in the forthcoming surveys we will be making some changes to the way certain practices are implemented.